The Worley family’s involvement in selling traditional furniture, dates back to the late 1950’s when Albert Edward Worley opened an antique shop and auction house in Purbrook, Hampshire. 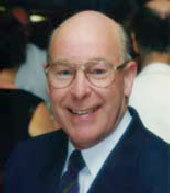 His son Adrian worked with his father, learning the trade and after a few years of working together, they formed the company A.E. Worley and Son Ltd.
Albert retired in the mid 1970’s, selling the shop in Purbrook, but Adrian continued the family business and started selling English Reproduction furniture to various trade customers across the South and West of England. In 1976 a different shop became available. No. 76 Northam Road, Southampton, from a retiring trade customer of Adrian’s. He decided to buy the shop and a few years later No. 74 was acquired, adding more showroom space and workshop facilities. Adrian was helped through these early years in the shop by his wife Marian and later his two sons James and Graham. After retiring in 2002, Adrian and Marion passed over the business to their two sons, James and Graham, who by now, had learnt their trade as furniture makers, restorers, French polishers and upholsterers. Skills, which have since been passed on to their current staff. 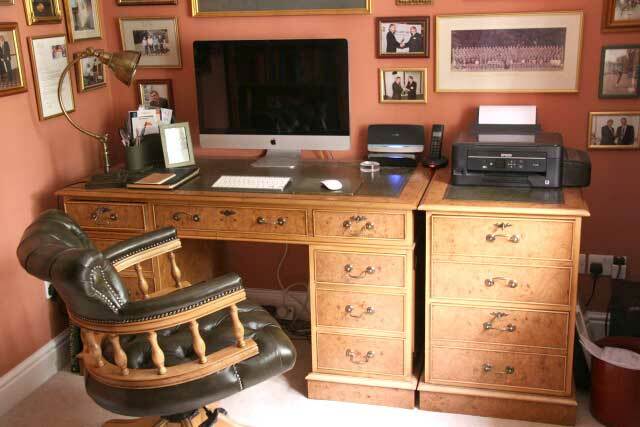 With continual expansion of the business, The Desk Centre are now leaders in supplying traditional English office furniture to the home and work place. Still manufacturing and upholstering in the UK, keeping delivery times low. The Desk Centre has supplied thousands of satisfied customers from the UK and all over the world and they still pride themselves on giving a quality personal service, with over 50 years experience gained in the furniture trade. Marking the 40th anniversary of the opening of their family run shop in Northam Road. Southampton. A sincere thank you. The furniture is perfect for the ship and the image I am creating for my business. The workmanship and material quality is second to none as was your care and service throughout the purchase. There were far easier options but I am glad I kept with my gut and made the purchase with you. 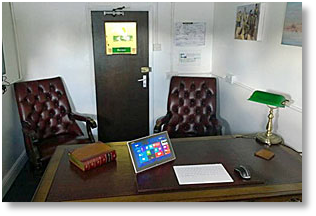 Please see photos attached of the venue and the now remodelled office. Thank you so much for the desk and chair. They are perfect, wonderfully finished and look just right in the study. The chair is really comfy and the desk is a joy to use. Thanks, Graham, for travelling up to Scotland and assembling it so professionally. We are very pleased and happy customers! I have just received my Writing Table and Chair. Wow, oh wow, oh wow! The chair is absolutely beautiful - what an amazing creation - such a joy to behold. The desk is as stunning as I remember from your showroom. This delightful duo is undoubtedly the piece de Resistance, not only in my office, but in my entire house. I just wanted you to share in my excitement! Thank you, Desk Centre for the two superb pieces of furniture for my place of work in London. 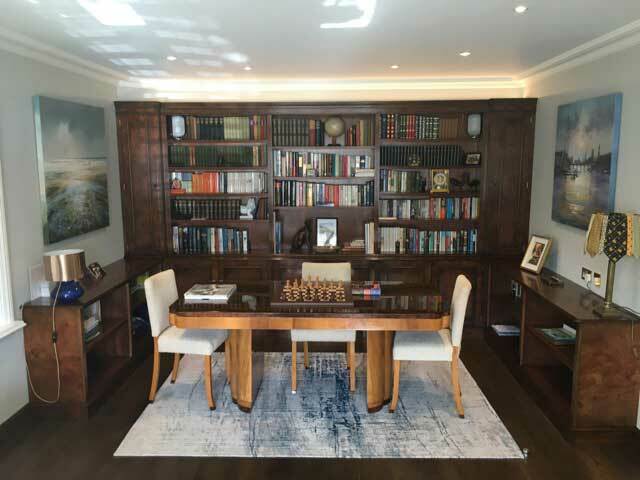 The leather-topped writing table matches perfectly with the existing oak cupboards and the printer table is absolutely ideal. 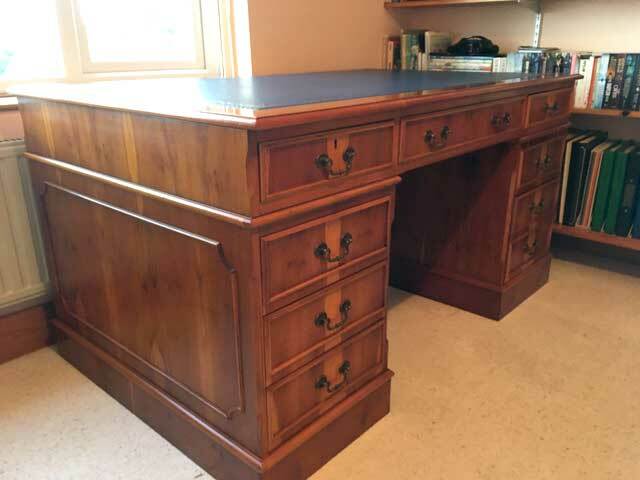 I would not hesitate to recommend The Desk Centre to anyone who is looking for a beautiful piece of hand-made furniture that is obviously built with such care and attention to detail. The craftsmanship is truly outstanding. 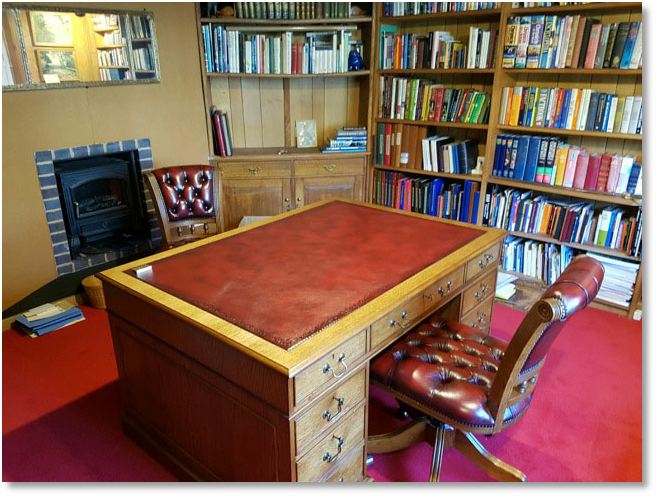 Having purchased a superb desk from you some years ago, and after a move to a smaller property, we thought of approaching you once again to find a desk more in keeping with our new surroundings. We are delighted to have done so: the quality and finish of the oak desk, combining as it does a traditional style with a modern lightness of tone, is outstanding. Your service continues to be both professional and friendly. We are very satisfied customers, more than happy to recommend you to others! Many thanks for your excellent service. We are delighted with the Desk. The wood finish is lovely and the leather top with gold gilding, compliments the piece very well. Pass on my appreciation to your workshop staff. 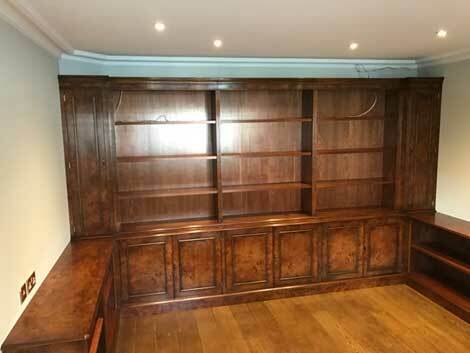 Just a short email to say how pleased we are with the Mahogany Bookcases that you delivered earlier on today. They fill space very well. The design, construction and finish are excellent. Stuart Bourne that delivered the Bookcases, was on time and very helpful. Just wanted to say how please my wife and i are with the Computer Desk you made for us. The printer fits in the pedestal cupboard very well, freeing up the Desk top, giving us more space to work. The Yew wood finish is beautiful. We would recommend your company to anyone. Mr and Mrs Bailey - Chipstead, Surrey.
" I just wanted to say how pleased I am with the Captains Swivel Chair that you made for me recently. 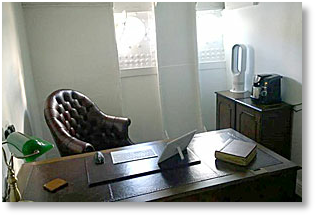 The polishing on the wooden frame, matches my existing Desk very well, and the Tan leather upholstery is very smart. " Dear James and Graham. Our study looks fabulous, now the Desk, and Filing Cabinets are in place. How nice it is to find an old fashioned, family run business like yours, where you can talk to the owners about your furniture needs, and not have to wait to long for delivery. Will recommend you to our friends and family. Your delivery Guys, delivered the made to measure Oak Bookcases this morning. They look very impressive. Just how i imagined them. The polishing shade, matches my old Desk very well. I just have the task of unpacking all my books now, and organising them on the various shelves. Should keep me busy for the weekend. Kind regards, Neil Sargent - London.
" Hello Mr Worley. The Desks look great in the office. All the staff are very please with them. The room now has a traditional feel, which is in keeping with the period of the building. Send my thanks to your workshop staff " John Bailey. We are so please we found The Desk Centre. Fantastic attention to detail, perfect product and outstanding customer service. John Lewis can learn a lot from these specialists! We are so impressed we are looking for another bespoke quote and order. Andrew and Penny, London N10. Having just taken delivery of my new desk. I just wanted to let you know how pleased I am with it. 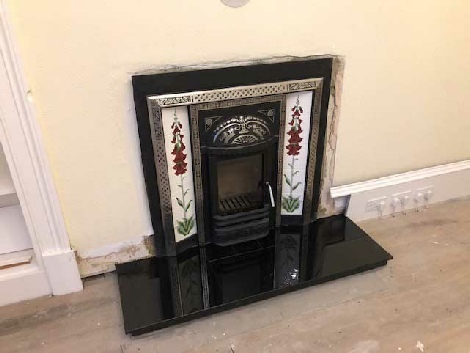 It was clear from your web site and catalogue that they were a quality product but it has exceeded my expectation. I should be grateful if you would pass on my thanks to all at The Desk Centre involved in making, finishing and despatching. Desk and chair arrived yesterday here in Rostock/Germany. I am very happy, excellent furniture, looks great and feels good. Wrapping was outstanding, you could have send it to the moon. Thank you again, I will definitely recommend your shop. Just a short note to say how delighted we are with the two Burr Oak Desks that you built for us. The whole experience of dealing with your company was a delight: from initial meeting at the shop, through design, flexibility of approach, quality of product and delivery. It was all faultless. Cathy and I would be pleased to recommend you to anyone. 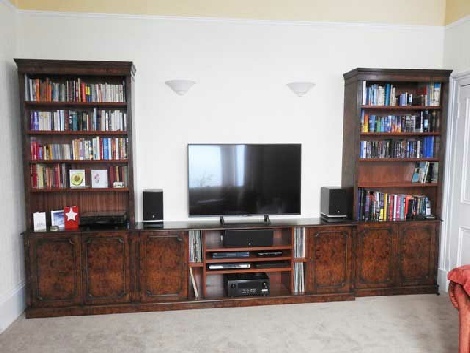 We live in Birmingham and were looking for a partners desk to compliment our existing oak bookcases and general decor. We found the very informative web site of The Desk Centre........ but their H/Q was in Southampton. The website was so beguiling that we decided to risk a trip and braced ourselves for a potential disappointment and wasted journey. 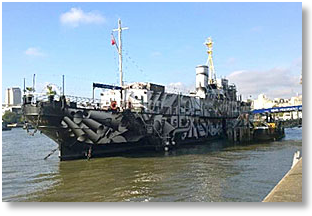 The experience was extremely worthwhile - the reality down there is even better than the excellent web site. We were met, and impressed, by the enthusiasm and knowledge of Graham Worley and we couldn't hold back from pacing an order after a very thorough look around. There had to be a catch - it had been so good so far. Our desk and two chairs where courteously and safely delivered by James Worley within an hour of the original quoted delivery time and was so better than we could have imagined. Our new desk fitted into our study like a glove and looks the proper part too. If you need a decent desk, a thing of quality, and the journey Southampton puts you off - go there anyway. Good luck to The Desk Centre and thank you to The Web for getting us there. 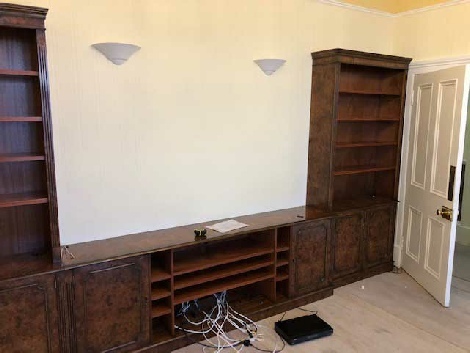 James and the team at the Desk Centre refitted my study with wall to wall Burr Elm Bookcases and other Filing Cabinet units. They are obviously neither the cheapest nor the quickest. But they are the best. 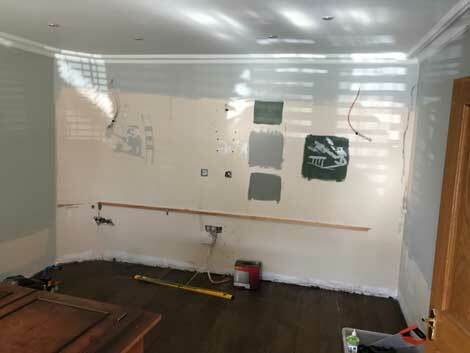 The quality of the work is first class, small details are dealt with as they should be, and timelines are set realistically and then met. 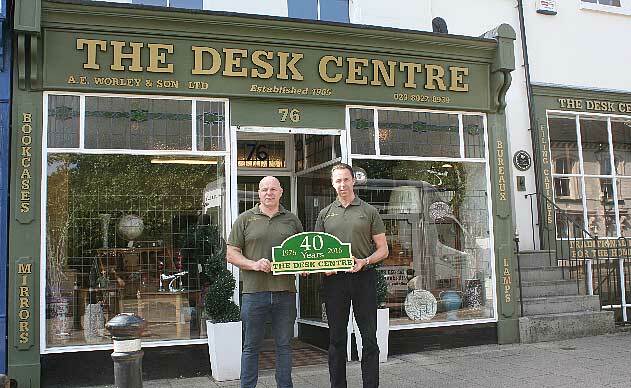 A family owned business where the family rolls its sleeves up and really cares about the end product and the service around it, The Desk Centre is where you want to go for a traditionally fitted office furniture. You won't be disappointed. Mr N Garland, Harpenden, Hertfordshire. I had been looking to replace my old office furniture without success over many many years. Desk, Filing Cabinet, Chair and Book Case which suited my bespoke traditional design and quality requirements at a competitive price. I am therefore very happy to report that The Desk Centre satisfied all my basic criteria with the added bonus that the management I met during various discussions were very helpful and understanding of my requirements. The products were delivered to time and agreed cost which is somewhat unusual in todays retail climate. I was again completely satisfied with the ordering and delivery process and of course the end product. I would have no problem recommending this company to anyone based on my personal experience of dealing with this company who remained completely professional at all times. Many thanks for your email, and even more thanks for producing the Cherrywood office that I absolutely love. It is a credit to you and the Desk Centre and it has provided me with an office that will tempt me never to leave home for work again! Looking for a new desk had been a laborious process. We'd seen lots of boring and expensive reproduction stuff and also lots of boring and even more expensive antiques. Drawn by The Desk Centre website we travelled up from Cornwall. Parking outside the unimposing collection of buildings comprising workshop and showroom we were not optimistic. Don't judge a book by it's cover! Inside is a treasure trove of traditional office furniture staffed by knowledgeable and skilled personnel. Partner Graham Worley helped us with our choice - a large and beautiful restored desk with unique patterning of light and dark yew. It has been so masterfully refurbished that it looks like new - and smells brand new. The price was a steal compared to what we'd previously seen. 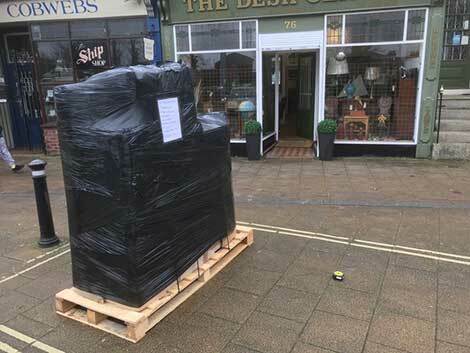 We paid for the desk shortly afterwards - over the 'phone - and it was delivered to Cornwall within a few days. J and I Winzar, Cornwall. 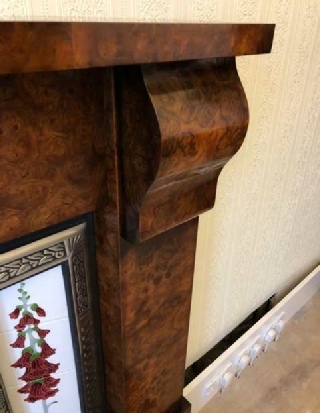 My wife and I were looking for a set of double bookcases with an adjoining cabinet to fill the living room wall of our 150 year old Victorian house. After a lot of searching in stores around the Glasgow area we were unable to find anything that came close to our expectations. We found the Desk Centre on the Internet and gave them a call with our specifications. Being located in Southampton we were concerned that this may cause a problem with delivery as we live in the Highlands of Scotland. 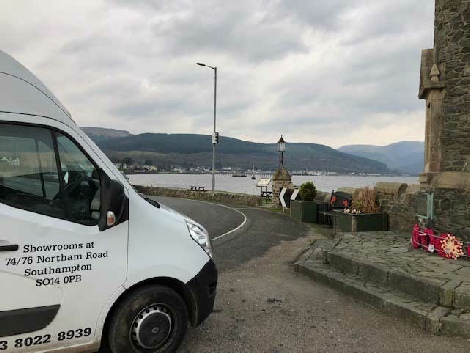 Both James and Graham were so professional with their advice and priced the furniture to include delivery, which in our case involves a ferry journey. 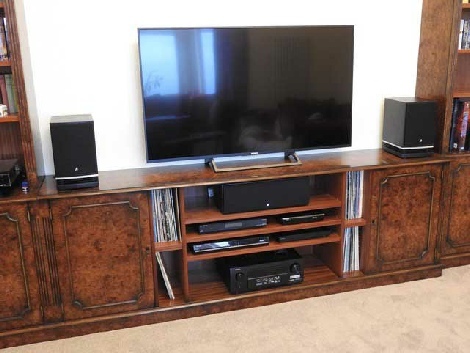 I am a bit of a perfectionist and had many specific requirements to house our home theatre set-up which would take centre stage between the bookcases. 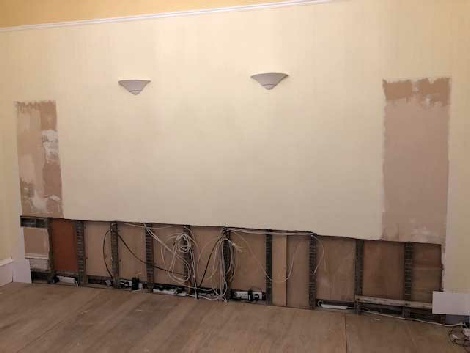 This required specific shelf heights, many cable tidies and holes cut in the back of the cabinets to take all the miles of 'spaghetti' for the surround sound and hi-fi equipment. 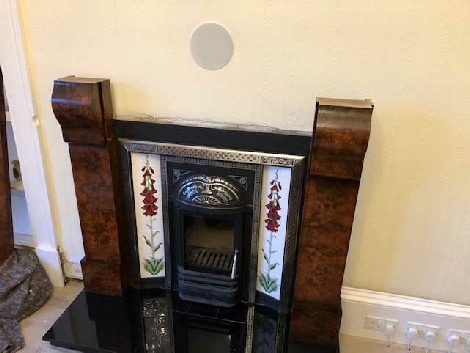 We decided upon the burr elm finish and, as we were having a new Victorian style fireplace installed at the same time, asked if the Desk Centre could create a fire surround in the same finish to match the bookcases which, of course, was no problem for them. 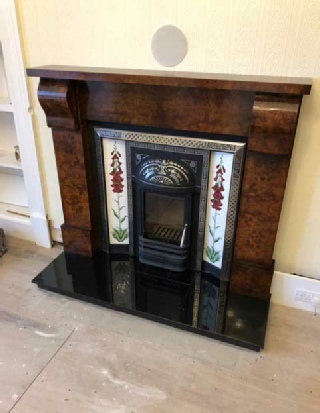 The fire surround, bookcases and cabinet are simply stunning, far exceeding our expectations. 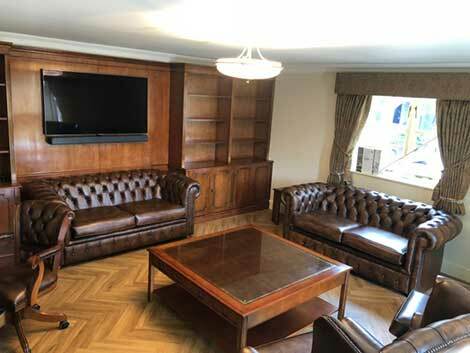 James personally delivered and fitted the furniture and we are still amazed by how the burr elm wood style and finish fits so perfectly into the period environment of the room and house. 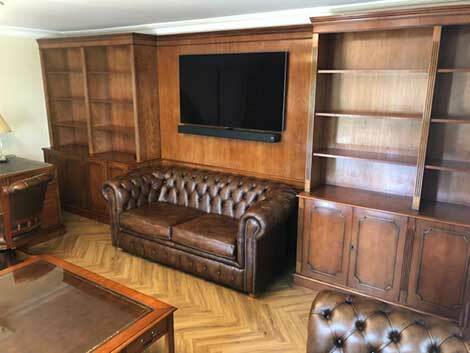 We cannot thank James, Graham and their team enough for the craftsmanship that went in to creating our bookcases, cabinet and fire surround and can thoroughly recommend the Desk Centre to anyone looking for a bespoke design. Having taken receipt and installed my desk and filing cabinet, I just wanted to take a minute to pass on my appreciation for your excellent service. The steps you took to understand my needs and to adapt the order accordingly have paid dividends. I must also pay tribute to your packers whose painstaking efforts to protect the shipment ensure the safe arrival of every component. My compliments and thanks to all concerned.